When your workplace campus has multiple buildings or locations or the employee parking lot is a distance from your office, requiring people to walk a long way from their car to get to work, with Intercampus Shuttle Services from Professional Charter Services, your employees can move freely from point A to point B. Does your workplace campus have multiple buildings or locations? Is your parking lot at a distance from your office, requiring people to walk a long way from their car to get to work? Do people frequently need to move from one building to another, but driving their own car is not always a good option? If you have a large workplace campus or office complex, remote parking lots, or multiple locations in the San Francisco area, it’s important to allow employees to move freely from point A to point B. Without an intercampus shuttle, people are forced to walk or bike between destinations, or drive their car if the distance is too great. Your employees are not only subject to getting hot, tired, and frustrated, by this system, it also consumes time that could be spent productively. Why not link all your buildings and parking lots with a simple, campus-wide transit system? Suddenly, everyone has a quick and easy way to get to any of your buildings or parking lots. No longer do they arrive hot, dusty, and annoyed; no longer do they lose valuable minutes in the day walking long distances or searching hopelessly for a parking place. The Intercampus Shuttles by Professional Charter Services give you just that. We provide the vehicle and the driver, and we work with you to establish the route and the timing of shuttles so that employees can always predict when and where they can hop on a shuttle to get to the place where they need to go. Intercampus shuttle services can offer a wide variety of benefits for workplace campuses with multiple buildings or locations, or offices with parking lots a distance away, requiring employees to walk a long way from their vehicle to get to work. For businesses that have a large workplace campus or office complex, remote parking lots, or multiple locations it is important that staff members have a way to get from one point to another. And without an intercampus shuttle bus, they will be forced to walk, bike, drive, or pay for a taxi if the distance between the two destinations is too far. When people are in need of a trip from one location to another, efficiency is key, especially when work productivity is at stake. When it comes to large workplace campuses or office complexes, remote parking lots, or multiple office locations, employees need their trips to be efficient, direct, and prompt. Employees that have to wait at a bus stop for a bus that makes multiple stops along the way and drops them off somewhere other than the closest entry point of their destination is not by any means efficient. Intercampus shuttles only follow an established route so that employees can efficiently predict when and where they can hop on a shuttle to get to the place where they need to go each and every time. In most cities, convenience means employees effortlessly hopping behind the wheel of a personal vehicle and driving to the desired destination. However, in large and busy cities, such as San Francisco, driving a personal vehicle is the opposite of convenient. With heaps of traffic, a scarcity of parking spaces, and other frustrations, employees driving their own vehicles to their specific destination is much more unrealistic and inconvenient. Intercampus shuttle buses, however, offer a solution to transport between sites conveniently. Of course, when employees take their individual vehicles to certain destinations, it can certainly have an impact on the environment. 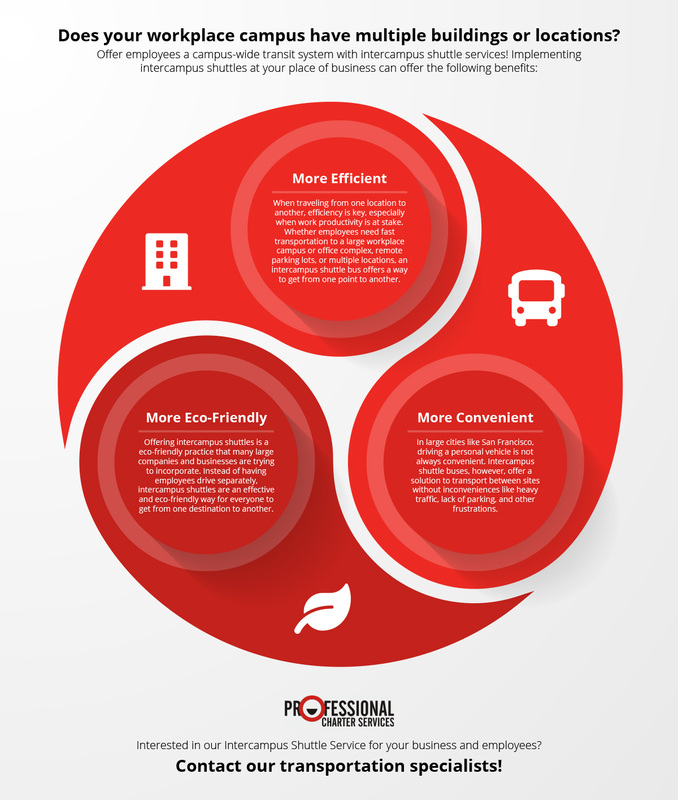 One way many companies are trying to contribute to eco-friendly practices is by offering intercampus shuttle services. Instead of employees driving their vehicles across town at random times — oftentimes, them being the only one in the car — intercampus shuttles are an effective way for everyone to get from one destination to another, all together, and at coordinated times. If you’ve never had an intercampus shuttle, you’re in for a treat! Your employees will love it, and productivity will go up when you reclaim all the lost time that people have spent just to get around. Get started by talking with one of our transportation experts. We will listen to your needs and work with you to implement the solution that you’re looking for. Call us today!